Around the world, building owners and investors are developing ambitious projects in collaboration with architects, planners and our professional partners. Often, tenders are put out at international level and a smart state-of-the-art solution is required. 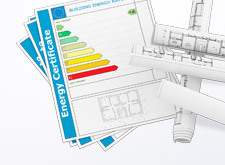 Environmental criteria are also becoming increasingly important. As a specialist in the use of water, Hansgrohe assists you with specific information and has the answers to many questions here, on the sustainability issue as well. This will make it easier for you to participate in tenders successfully. 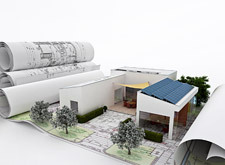 To help ensure that your planning and presentation is a success, you will find more current research sources on our website, such as architecture and design guides and inspiration. We provide you with information on the most important trends and present some excellent examples of successful bathroom planning worldwide. 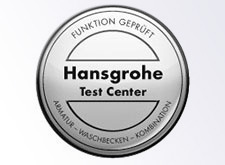 Provide global certificates for Hansgrohe products showing that the company meets relevant norms for technology, safety and environmental protection. Customers are placing increasing value on comfort, product quality and environmental protection. Here too, Hansgrohe products are the right choice. Announcements and material reports, trends and example projects: We provide you with links to interesting websites of other professionals and associations. 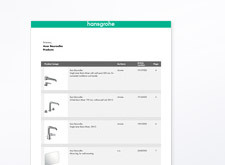 Easy product search on our pages: with an individual product catalogue, which you or your customer can put together.